Summertime is the season for an abundance of delicious home-grown tomatoes. Sure, you can eat them with a dash of salt, use them in your favorite sauces or even can them to enjoy in the winter, but one of our favorite ways to eat them is in an oven-warmed slice of Tomato Pie. Dilly Beans Catering & Cafe in Conway occasionally offers Tomato Pie as a daily special. Owner Kim Hardee offered up this recipe, courtesy of Rachel Christensen. Top it with either a layer of Gouda cheese (Kim’s favorite) or goat cheese (Rachel’s favorite). Either way, it’s delicious! Cut tomatoes into slices. Place the tomatoes in a colander in the sink in 1 layer. Sprinkle with salt and allow to drain for at least 10 minutes. In a skillet, caramelize the onions and garlic. Bake pie crusts according to package directions. Layer the onions along the bottom of the crusts, then add tomatoes. Top the tomatoes with a layer of chopped fresh basil. Season with salt and pepper. 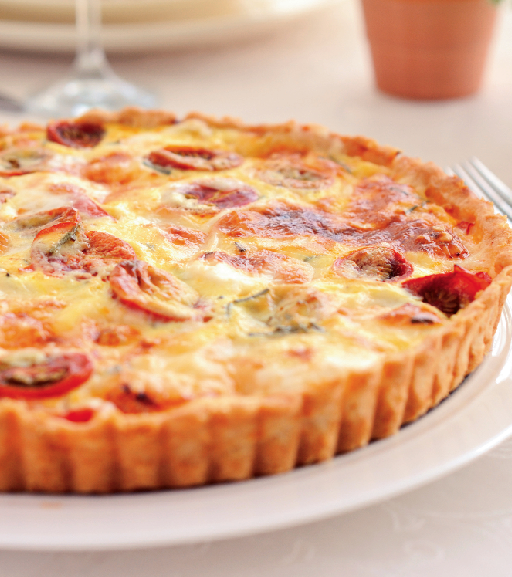 In a mixing bowl, combine the cheddar, mozzarella and mayonnaise and pour half into each pie crust. Top each pie with either 1/2 cup Gouda or 1/4 cup goat cheese per pie. Bake at 350 degrees for 45 minutes or until cheese is brown and bubbling.